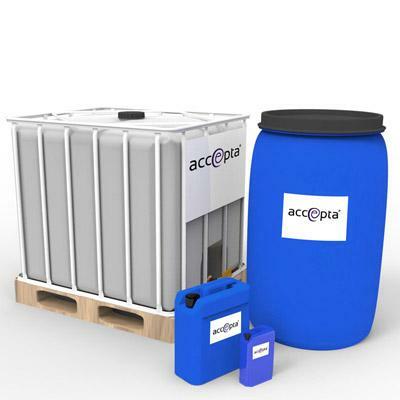 Accepta 2830 is a high performance, multi-functional cooling water treatment scientifically formulated for the treatment and protection of industrial cooling water systems from the detrimental effects of scale, corrosion and fouling. Accepta 2830 offers excellent corrosion control by incorporating a very powerful organic ferrous metal inhibitor and a specific yellow metal inhibitor. Accepta 2830 offers excellent calcium carbonate inhibition in waters where the LSI approaches 3, together with calcium phosphate and calcium sulphate inhibition and dispersancy. Accepta 2830 also incorporates an excellent iron dispersant as well as a general dispersant for suspended solids and silt. The individual components of Accepta 2830, in addition to their primary function, also exhibit properties in other important areas. For example, the calcium carbonate inhibitor also disperses iron, and the calcium phosphate dispersant also inhibits calcium carbonate precipitation and provides additional corrosion protection. These synergistic effects mean that Accepta 2830 can be used at low dosage rates whilst still providing complete system protection. Accepta 2830 is suitable for use under most water conditions including acid dosed; however, it is NOT suitable for use in systems with zero hardness. This is because the product requires calcium in order to effectively protect carbon steel. All components of Accepta 2830 are resistant to halogens. Accepta 2830 incorporates an innovative organic tracer compound that can be used to accurately monitor and control product dosage levels. This results in significant improvements to system protection and more cost effective product consumption. Product dosage rates can be fully automated using the Accepta WM and Accepta LD probe. The Accepta LD probe causes the tracer dye to fluoresce, the levels of fluorescence, being proportional to the amount of Accepta 2830. The fluorescence is measured by the probe; a dosing pump is then initiated to maintain the correct treatment reserve. Best results are achieved if the pump is controlled using an analogue signal. Dose Accepta 2830 as advised by Accepta technical support team. For further technical assistance concerning Accepta 2830 please contact Accepta.